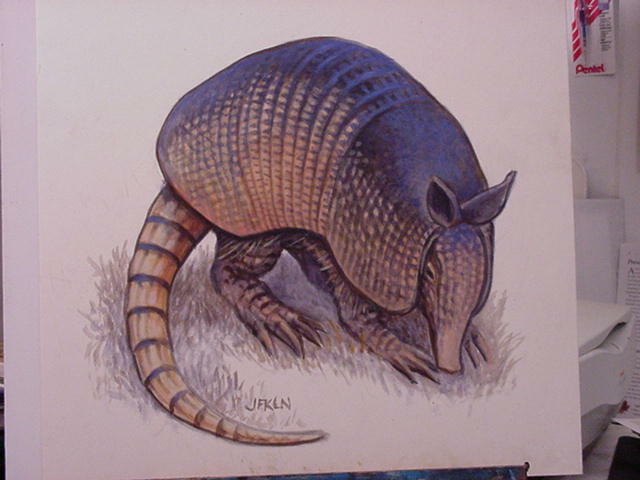 This acrylic painting is the most recent Armadillo Art that I have done. I have done many over the years, in fact the ones I drew during the 1960s, '70s, and '80s left a bit of an impact on the Austin Music Scene. The Armadillo World Headquarters, which I helped found, took it's name from the drawings I had been doing at The Vulcan Gas Co. ,predicessor to the AWHQ. Beginning in 1968 it became my recuring motif.